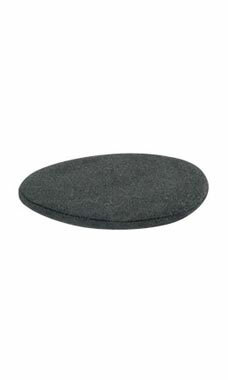 These 4 ½” stretchy foam pads slip easily over the single hat/cap displayer to provide cushion for the hat or cap against the metal. Use with our single hat/cap displays for slatwall, wire grid, or pegboard to create a unique display to showcase your hats and caps. Hat Rack Foam Pads are in stock and available for immediate shipping on orders placed before 3 p.m.
Great foam padding prevents creases in hats, makes displays look more professional, and protects both display rack and interior of hats from tarnishing. These pads work week for my hat tree. A little bigger than I expected, but they will work. Picture is misleading. All it is is felt fabric to wrap around the steel. I guess the intended purpose is to help prevent the hat from sliding. But, hat still slides around. This foam hat display pad did its job for the hat display rack. Helps keep the hat on the display similar to a non-skid pad. Worked perfect for what I needed! Fast shipping! These pads make help keep the rack looking polished and professional. This is exactly what one expects: a foam cover to go over the wiring of a hat display. The photo is a little deceiving - the material is not opaque, but quite transparent. These are cheap so get all you need to make those hat displays extra sharp! These display pads are great. They are a perfect fit on the Hat Rack and keep my hats in place. This was a great item to try out on my hat displays. It really protects the cap from getting out of shape. All the products I have ordered from this company always arrives so fast and the products are in perfect shape when I receive it. Service and customer service is wonderful. Wish all companies were this great!! This item allowed me to protect my outstanding hat selection from the damage by snags or fabric pulls. These are a must have to go with the hat display! great quality!! Excellent value, great turn around, no disappointments! Your hats will sit right when using this pad with the hat display rack for your grids. The photo for this product is misleading. It appears to be a solid domed piece of foam which will support and help keep the shape of the supported hat. The photo should be taken a a different angle to show that this is a slip on cover for the single hat display rack. Would like to see these included with the single hat display rack instead of buying them separately. they are very thin and keep falling off of the hat stands.